At SeaCure Moving we understand that local moves can be just as challenging as long distance moves. For that reason as trusted New Jersey Local Movers it is important to us that we help create a seamless transition for our customers. As Full-Service New Jersey Local Movers we offer a number of moving services that may require special moving instructions of deliverables including ATV’s or motorcycles. 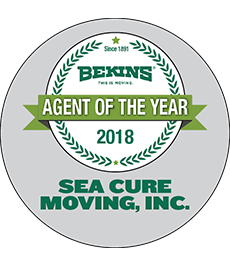 As an Agent of Bekins Van Lines we have the resources and capabilities at our disposal to help you move even the most challenging of items. As New Jersey’s Local Movers, we will work with you to create customized approach to your move meeting your all of your moving needs. Being a family owned business it’s important that we finish the job through to completion. We will help oversee your relocation from start to finish guaranteed. If you’re looking for New Jersey Local Movers that are affordable, reliable with years of experience, contact us or fill out our quote form for a free moving quote today!